A lithograph of Acoma Pueblo made in 1848. Spanish victory in battle, civilians massacred. The Acoma massacre, or the Battle of Acoma Pueblo, was fought in January 1599 between Spanish conquistadors and Acoma native Americans in what is now New Mexico. After twelve soldiers were killed at Acoma Pueblo in 1598, the Spanish retaliated by launching a punitive expedition, which led to the deaths of around 800 men, women and children during a three-day battle. Several hundred survivors were also enslaved or otherwise severely punished. In the late 1500s, the Spanish began their conquest of the Pueblo people in northern New Spain and in 1595 the conquistador Don Juan de Oñate was granted permission from King Philip II to colonize Santa Fé de Nuevo México, the present-day New Mexico. Relations between the Spanish and the Acoma people had been mostly peaceful for several decades after the two groups first came into contact around 1540. In 1598, the Acoma leader, Zutacapan, learned that the Spanish intended to conquer Acoma Pueblo. Initially, the natives planned to defend themselves; however, their belief that the Spanish were immortal and their knowledge of Spanish atrocities committed in the past led the Acoma to try to negotiate a peaceful solution to the conflict. Accordingly, Don Oñate sent his nephew, Captain Juan de Zaldivar, to the pueblo to consult with Zutacapan. When Zaldivar arrived on December 4, 1598, one of the first things he did was to take sixteen of his men up the mesa on which the pueblo was located to demand food from the natives. After being denied the food they had demanded, the Spaniards allegedly attacked some Acoma women. A fight ensued, leaving Zaldivar and eleven of his men dead. 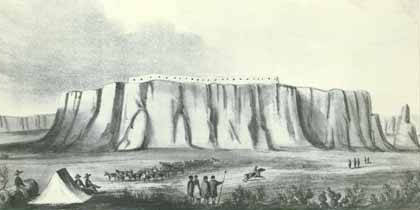 When Oñate learned of the incident, he ordered Juan de Zaldivar's brother, Vincente de Zaldivar, to lead an expedition to punish the Acoma. Taking about seventy men, Vincente de Zaldivar left San Juan Pueblo in late December or early January and arrived at Acoma Pueblo on January 21, 1599. The battle began the following morning, January 22. For the first two days the Spanish and Acoma skirmished inconclusively until Zaldivar developed a plan to breach the pueblo using a small cannon. On the third day, Zalvidar and twelve of his men ascended the mesa and opened fire on the pueblo with the cannon. After some time, several Acoma homes caught on fire and were destroyed while the conquistadors stormed through the settlement. There were an estimated 6,000 natives living at or around the Acoma Pueblo in 1599, at least 2,000 of whom were warriors. Of the 2,000, about 500 were killed in the battle, along with about 300 women and children. Some 500 prisoners were taken and later sentenced to a variety of punishments. Don Oñate ordered that every male above the age of twenty-five would have his right foot cut off and be enslaved for a period of twenty years. However, only twenty-four men actually received amputations. Males between the age of twelve and twenty-five were also enslaved for twenty years along with all of the females above the age of twelve. Many of these natives were dispersed among the residences of government officials or at Jesuit missions. Sixty of the youngest women were deemed not guilty and sent to Mexico City where they were "parceled out among Catholic convents". Two Hopi men were taken prisoner at the pueblo; after each had one of his hands cut off, they were released to spread the word of Spain's resolve. When King Philip heard the news of the massacre, and the punishments, Don Oñate was banished from New Mexico for his cruelty towards the natives and later returned to Spain to live out the remainder of his life. Several Acomas escaped capture by the Spanish in 1599 and by 1601 they had rebuilt their pueblo, which still stands. The massacre remains a sensitive issue in the United States. In 1998, during the 400-year anniversary of Spain's founding of New Mexico colony, a group of Acomas cut off the right foot of Oñate's twelve-foot statue in Alcalde, New Mexico. They later issued a statement about the incident: "We took the liberty of removing Oñate's right foot on behalf of our brothers and sister of Acoma Pueblo ... We see no glory in celebrating Oñate's fourth centennial, and we do not want our faces rubbed in it." One Acoma man, Darrell Chino, said, "It was funny when it happened to the statue, but it wasn't funny when it happened to the real people." At the Oñate Monument and Visitors Center, Estevan Arrellano, the director of the site, supervised the attachment of a new foot to the statue. He later said, "Give me a break – it was 400 years ago. It's okay to hold a grudge, but for 400 years?" On April 21, 2007, an eighteen foot tall statue of Don Oñate – the largest bronze equestrian statue in the United States – was erected at El Paso. Members of the Acoma tribe attended the dedication ceremony and protested against the statue's construction. ↑ "Oñate, Juan de". New Mexico Office of the State Historian. http://www.newmexicohistory.org/filedetails.php?fileID=312. ↑ Knaut, Andrew. The Pueblo Revolt of 1680. Oklahoma: The University of Oklahoma Press: Norman, 1995, p. 69. ↑ Brooke, James (February 9, 1998). "Conquistador Statue Stirs Hispanic Pride and Indian Rage". The New York Times. http://www.nytimes.com/1998/02/09/us/conquistador-statue-stirs-hispanic-pride-and-indian-rage.html. Kessel, William B.; Robert Wooster (2005). Encyclopedia of Native American Wars and Warfare. New York: Infobase Publishing. ISBN 0-8160-3337-4. http://books.google.com/books?id=laxSyAp89G4C. Knaut, Andrew L. (1995). The Pueblo Revolt of 1680. Oklahoma: University of Oklahoma Press. ISBN 9780806129921. http://books.google.com/books/about/The_Pueblo_Revolt_of_1680.html?id=3P4GdbUyKQYC.